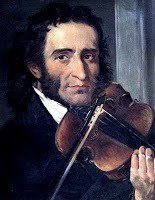 Nicolo Paganini is the most famous violinist who ever lived. He was born on October 27, 1782, in Genoa, Italy (Beethoven was 12 years old.) His early studies were on the mandolin, instructed by his father, who played mandolin on the side to supplement his income. At age 7, Nicolo switched to violin and began studies with Servetto, then Costa, Rolla, Paer, and Ghiretti. By age 18, he had achieved an important appointment to an Italian royal court, after which he received a second appointment at a different aristocratic court (a French court) in Tuscany. Neither appointment meant a great deal to Paganini since, especially after 1813, he earned a very good living through free-lancing. His stupendous and unmatched virtuosity on the violin made him a legend (and a fortune) in his own time. He is also famous as a composer of prodigiously difficult violin music. Because he could execute things with the violin that seemed humanly impossible, he was rumored to be in league with the Devil. Among many other works, he wrote six violin concertos, but is more famous for his twenty four caprices for solo violin, which have been recorded by nearly every violin virtuoso of our time, except Heifetz. His favored instrument was a Guarneri del Gesu of 1742 or 1743 (nicknamed the Cannone.) He died young, at age 58, on May 27, 1840. It is said that Sivori, his pupil, played for him one last time (at Paganini’s home in France), two weeks before he died.